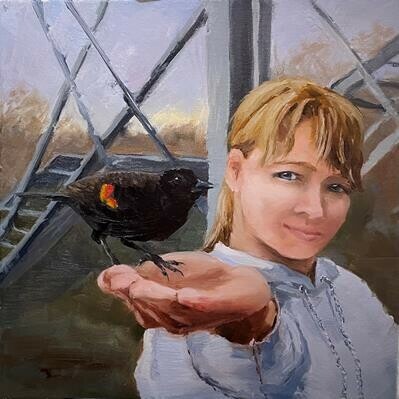 I am an oil and watercolor painter in the Pacific Northwest. My subjects include animals, landscapes, and sometimes still life. I especially enjoy Plein air painting. Member Plein Air Washington (PAWA). I am part of a family of artists, I grew up with my mom as a professional wildlife and seascape painter (and in-house teacher!). My husband, sister, and father, and some grandparents also paint or have in the past. As a child growing up on the Oregon coast, mom would take my sister and I to art classes in a wonderful old building with high ceilings and lots of light. We did things like watercolor and pottery then. Later we took a portrait class, which was also fun and taught many of the basics on subject and form. Many museums and galleries would be visited, all over the west coast, Wyoming, Montana, and New York. In my teenage years I was very interested in photography, particularly applying an artistic bent. I did well in shows and publications, but in the end liked the more direct interaction of painting. The years thereafter were filled with horse riding and adventure and travel to exotic lands. Along the way I met my husband, himself an artist. After moving to the Seattle, Washington area, we went together and did a sketchbooking class in watercolor as a refresher, which impressed upon then the freedom that creativity can have in your lives. I value continuing education by attending demos, watching art videos, reading relevant art books, and going to life drawing sessions. Soon after moving to Washington I discovered plein air painting. Always having been more suited to outdoor life than the carpeted interiors, now I could setup my studio right outside in the elements. This has both been a lot of fun, challenging, and I’ve really learned a lot. Painting from nature and real life is the best teacher. The feelings, mood, and expression can only be caught on canvas when experiencing it in the present. Sometimes these paintings created this way go on to be studies for larger studio works, but oftentimes they stay just as they are, fresh and in the moment. Avid birders (as birdwatchers are called) my husband and I like to visit national parks, wildlife refuges, and other places all over the US and abroad. We currently reside north of Seattle. We enjoy other hobbies such as hiking, gardening, and learning languages. So much can be learned from animals, both wild and domestic, that often they will be a featured as a subject in my art. Some favorite artists are Albert Bierstadt, Thomas Moran, Carl Runguis, Cory Trépanier. Painting is a journey of learning that never ends. 2018 Shoreline Juried Arts Festival -2 juried entries accepted.